If you have unlock some characters, choose your leader wisely. 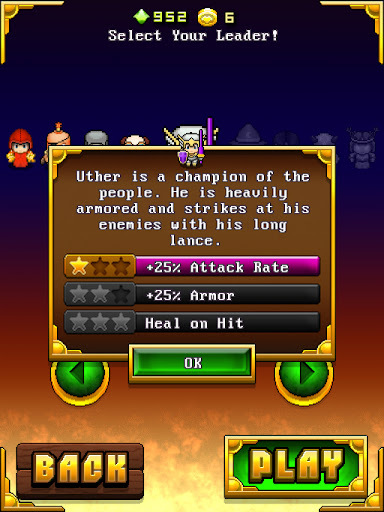 Here, I love to use archer for the early time playing before I unlocked Uther, the champion. Archer (Merida) has lightly armored, but she has far attack range. The trick, do the attack from back side of your enemies. Avoid to attack from frontal side of your enemies , especially if your enemy is knight. I sure you'll be dead easily. That's why we need to collect gems. The better you play, more gems you'll get. 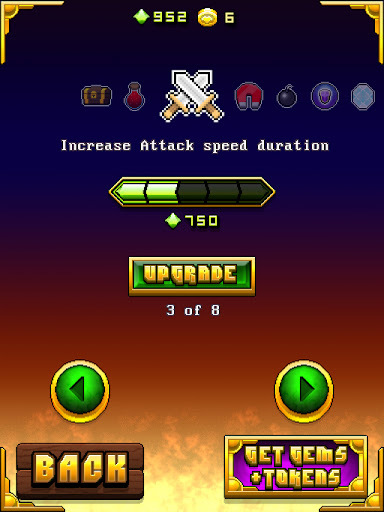 Use the gems especially to upgrade the power ups. Firstly, upgrade the potion to increase your HP, don't forget the shield. The others are also important too. So, don't hesitate to upgrade it all. 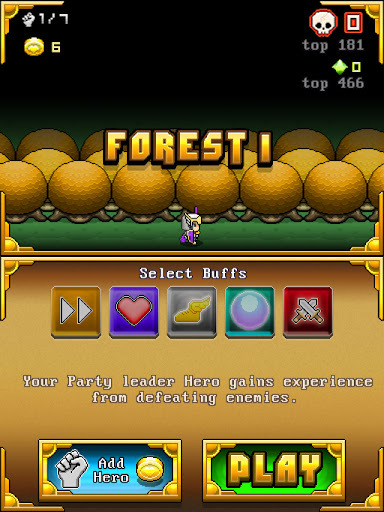 After you upgraded your power ups and your characters, what must you do next? Learn, how the enemies attack. Yeah! - Never attack the rats from frontal side. Although, it's a weak enemies, but it run faster than you. So, be careful, if you hit it. You'll die cheaply. Trick: use side attack to defeat rats. Can be used bomb or blazer to hit. 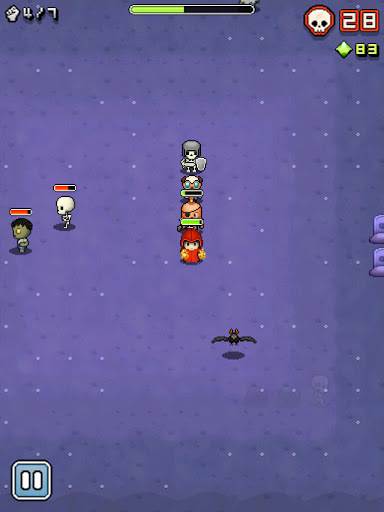 The leader can be hit from frontal but choose the one which has far range attack, and quickly turn right or turn left. 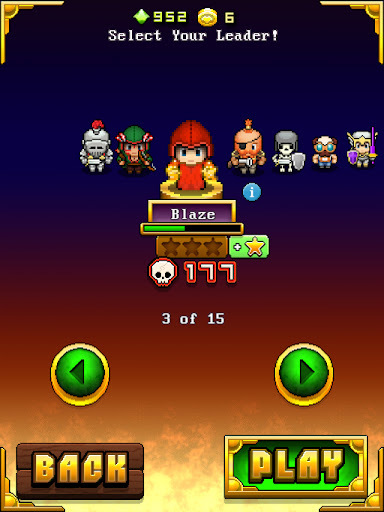 If some of your allies was defeated, at least the leader still alive and you can collect your heroes again. - Careful, with spiders, some of them are poisoning , or their webs can make us move slowly. Trick: hit the spider from behind or side. Can be from frontal too. The effective one is back side, if your leader is strong enough, use the side attack if you have blazer or bomber or the one which has big damage. Trick: Try to attack from side way or from behind, by using the one which has big damage weapon. Avoid to attack from frontal , especially for knight. He has wide and far range attack, also activate side range attack. So, watch out ! and take your steps carefully. If some of you have more information about this, please tell yours in comment section. Buffs is used as a headstart, can be useful sometimes if you use it properly, caused it costed you token not gem. So, be wise. Luckily, tokens can be get by watching ads video (sometimes the video is available more than 5 times,which mean you'll get 5 tokens ;) or get it during the gameplay. Thanks for reading.... Happy playing!